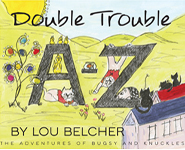 I have a two-da y book fair coming up this weekend. It’s in Melbourne, Florida at the Eau Gallie Civic Center. If you happen to be in the area, stop by. If you like art, you’ll also be pleasantly surprised that it’s in conjunction with the ArtWorks Eau Gallie Fine Art Festival. What a great event this is. The artists not only show their artwork, but they work throughout the event, demonstrating how they make their wonderful artistic creations. This is my third year at the Book Fair. I love it. I love seeing other Florida authors and what they are writing. I love talking with other creative people. 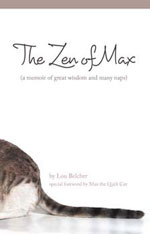 And, I love talking about Max (he was my cat and is the subject of my book: The Zen of Max). This year, I thought I’d blog about getting ready for a book fair. It might be helpful to you when you show your work at one of your own, and I know it’ll be helpful for me in getting ready. Because this one is during such a huge community event, I know that I need to go, planning on parking the car and leaving it. And because the book fair is continuous from 10 AM until 5 PM, I know that I’ll need to get there about 8:30 or 9:00 and take everything with me (food drinks, books, marketing materials, etc) that I’ll need for the entire day. Here’s my list for this year. 9. post cards about Florida Book News (another blog of mine) and sign up sheet for Florida Book News mailing list. I think that’s it. Mmy philosophy is that it’s better to take too much than too little. If you think someone will ask for something, then take it along. Not everyone will buy your book, but if you give them your card or a post card they might remember you later and buy one for a friend or give your card or brochure to a friend. The bottom line in living through a book fair is to have a good time and learn as much about the people who stop to talk with you as they do about you. People will remember you longer if you let them talk a little too. This entry was posted in book marketing and tagged book fair. Bookmark the permalink.